I don't post post many savory recipes on this blog, but I do love to cook as well as bake. What do I cook? People seem to ask me this a lot, and my response is generally... anything but Chinese food. It's not that I don't like it, but for the most part I don't think I can do it as well as the restaurants I've eaten at. So why bother? A lot of Chinese cooking requires high wok heat. It's what gives the food such good flavor. But you can't replicate that heat at home. It just isn't the same. Don't get me wrong, I still make a few Chinese dishes that are more like Chinese home cooking than restaurant fare. Stuff my mom use to make us, like ginger scallion noodles and spam and egg omelettes. But not much else. Scallion parents were a family take out staple growing up. They were a guilty pleasure. Crispy, salty, flakey with a slight chew, they are addictive. So when my sister forwarded me a scallion pancake post from @bliu07, I knew I had to give a shot. This recipe is far from scary. 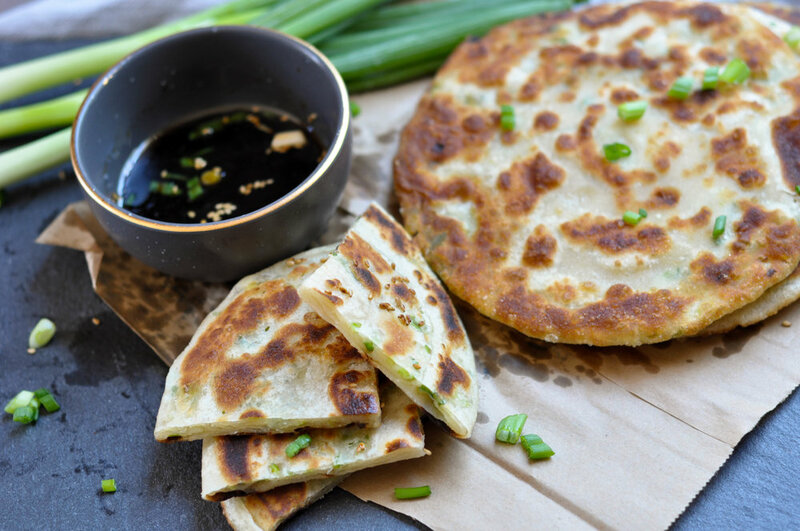 If you can make a cinnamon roll, making these Crispy Chinese Scallion Pancakes are a snap! I don't usually have a lot of time to cook regular meals since I work 5 days a week and my weekends are generally consumed by errands, kids events, prepping and planning meals for the week or baking for this blog. So, I'm very grateful to have my parents around to watch my kids while I work and to help me cook dinners on those days. It's one less thing on my plate and for that I'm thankful. But cooking is something I miss doing. I love making large meals for my family if time wasn't such a challenge. I had a couple of hours free this Sunday morning so straight after breakfast I whipped these up. The dough for this is surprisingly simple. It's seriously just flour and water. The original recipe from the Omnivore's Cookbook calls for Chinese All- Purpose flour. Chinese flour is more bleached and has less gluten content than American All Purpose flour. You should be able to find it at any asian or Chinese market. I had some left over from my mostly failed experimentation with Chinese steamed buns...which my husband has now dubbed "The Bao Incident" but I'll revisit that some other time. Back to this dough. A simple mixture of flour and water. This is mixed then kneaded till soft, then allowed to rest for 30 minutes. I may have left this to rest for an hour because I forgot I had to take the dog to the groomers, but it still turned out perfect. While it rested, I made a paste out of flour, salt and melted lard. Yep, apparently I'm a big proponent of lard, but in Chinese cooking it makes a big difference in flavor and texture. The rested dough is then divided into 6 balls and rolled out into a thin oval. 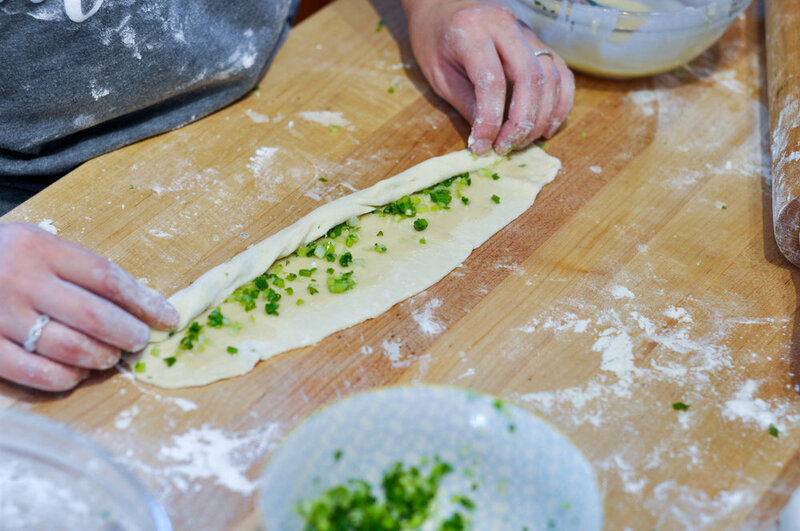 Brush the dough with the lard paste and sprinkle on the scallions. I say the more the better! I made the mistake of not flouring my board enough for my first piece and it ended up sticking to the board as I tried to roll the dough around my filling...it was not pretty. But I learned from this mistake and the rest came out pretty as can be. 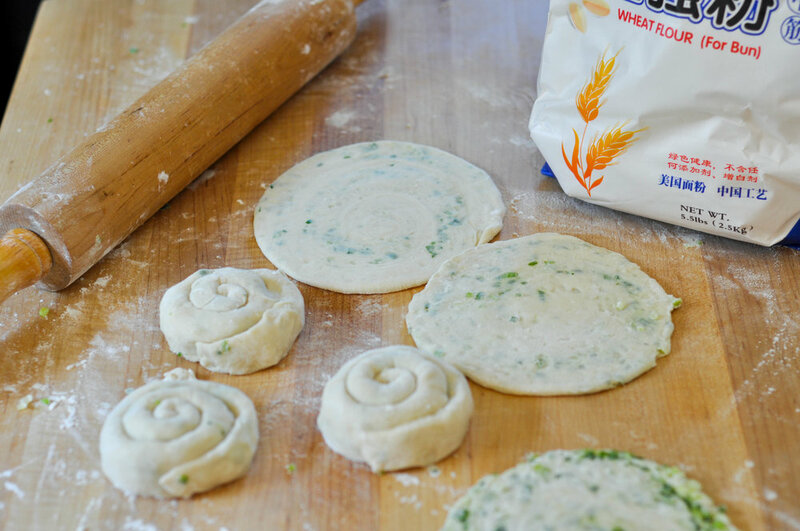 The rolled dough is then spiraled in on itself and rolled flat into a disk. Then it's time to fry. These pancakes fry up golden brown and crisp with thin layers on the inside cradling all that scalliony goodness. Try it with the soy sauce dip below for a great snack or meal. They were so good we ate it for lunch! Make the dough: place the flour in a medium bowl. Slowly pour in boiling water while stirring with a rubber spatula or chopsticks until large flakes have formed. Add cold water, a little at a time and keep stirring until there is little or no dry flour on the bottom of the bowl. Dust both hands with a thin layer of flour. Press and work the dough together by hand to form a dough ball. The dough should slightly sticky. Turn the dough out onto a lightly floured board and knead it gently, adding extra flour as needed, until the dough is as soft as an earlobe. This takes about 5 minutes. Coat a clean bowl with oil. Place the dough in the bowl and cover with plastic wrap or a damp towel. Let the dough rest for 20 to 30 minutes. While the dough rests, make the filling. In a small bowl, whisk the 1/2 cup flour, melted lard and salt until combined. It should make a thin paste, Set Aside. Once the dough has rested, turn it out onto a floured surface and divide into 6 equal pieces. Roll into balls and cover the rest of the balls while you work with one. On a lightly floured surface, roll one of the dough balls out into a long thin oval. Approximately 12-14 inches long. Roll it as thin as you can without tearing. Be sure to use enough flour to prevent the thin sheet of dough from sticking to your board. Brush the lard paste onto the surface of the dough and sprinkle with scallions. Starting from the long side of the dough, roll it up as you would a cinnamon roll. Once it's rolled into a cigar shape, take one end and spiral the dough in on itself. Set this aside and do the same with the rest of the dough balls. Take the Spirals and roll them flat to a circle about 6 inches in diameter. Sprinkle with sesame seeds. In a large frying pan, heat canola oil on medium high heat. Fry each pancake till golden brown and crisp. About 2 minutes on each side. Drain on a paper towel, Cut into quarters and serve with the soy dipping sauce.